I just got back from an amazing trip to the beautiful and inspiring Greece and its gorgeous islands, and I can’t wait to make some of my fresh discoveries in the kitchen. Fava is absolutely one of the best things Ben and I ate on this trip. 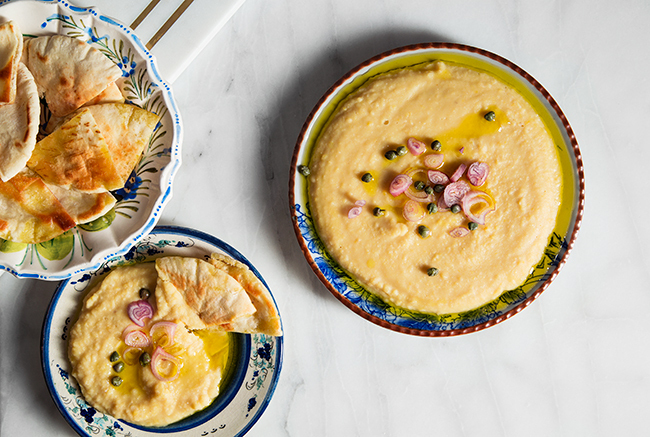 We’ve tasted various interpretations of this traditional dish at a bunch of restaurants, our favorite being the fava bean and capers one from a cliff-perched spot in Oia, Santorini, — today I’ll try to get as close as I can to its perfection with this recipe. 1. Place the peas and the beans in a bowl and cover with water, let soak for 2 hours or overnight. Drain and rinse. 2. In a pot over medium-high heat, combine 3 Tbsp oil with onion and garlic and stir until soft and start to golden. Add the peas and the beans, cover with 3 1/2 cups of water and allow the mixture to come to a boil. Turn the heat down to low and cover the pot. Simmer, stirring occasionally, until very tender, about 40-50 minutes. Salt to taste, take off the heat, let cool. 3. Puree in a blender, taste and add more salt as needed. 4. Serve topped with a generous drizzle of olive oil, capers, and shallots. 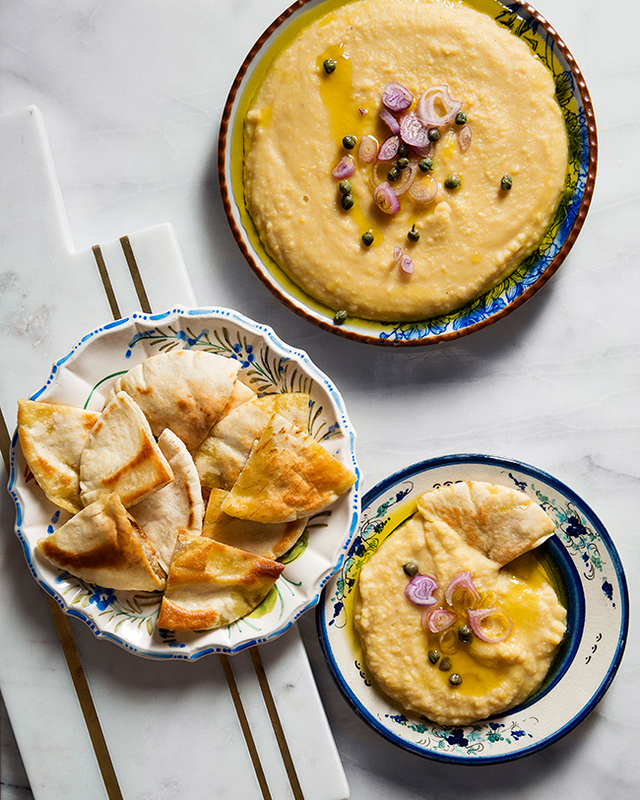 Optional: toast pita bread and use it as "chips" for this dip. I also like scooping fava with veggies like bell peppers and cucumbers.